Diana López on Diana López: "Diana López is the author of Sofia's Saints (Bilingual Review Press, 2002) and the middle grade novel, Confetti Girl (Little, Brown, 2009). "Her work is also featured in Hecho en Tejas, an anthology of Texas Mexican writers, and in journals such as Chicago Quarterly Review, Sycamore Review, and New Texas. "She lives in San Antonio where she teaches English at St. Philip's College." What kind of teenager were you? Who were your favorite authors? Very skinny, very shy, tomboyish, and clumsy. By the time I was in eighth grade, I had fractured seven bones for things like playing Tarzan and trying to be a Harlem Globetrotter. But I felt graceful when I ran. How I loved to run. I grew up in a small house--three bedrooms, one bathroom, six people. So I was desperate for solitude, and running was a great way to be alone. Judy Blume and S.E. Hinton wrote about kids that felt like the kids in my neighborhood and school. But the stories I couldn't stop reading were the Greek myths. I still have my Edith Hamilton book from the seventh grade. The Diary of Anne Frank taught me that a journal could be a best friend, and I've had my own version of Kitty since 1985. The first Chicano novel I encountered was Bless Me, Ultima by Rudolpho Anaya (1972). What a great book. The way the protagonist, Tony, felt torn between two worlds and the questions he asked about religion, vocation, miracles, myths... I had the same questions. I wasn't alone after all, and as long as there are good books, I'll never be alone. My writing began with a journal. After a while, I started to dramatize my experiences with description and dialogue. So I thought I could write stories, but I didn’t know how. In the early nineties, the Guadalupe Cultural Arts Center offered writing classes with people like Nan Cuba, Jesus Cardona, and Pat Mora. I signed up, and they were wonderful workshops. But, I could never work my way into a critique group. That’s when I realized I’d have to pay someone to read my stuff. So I took the MFA path by going to Texas State. I was so intimidated at first. My professor, Tom Grimes, advised me to spend time away from workshops because I "was writing for the class." Since I didn't have deadlines, I decided to try a novel, Sofia's Saints. When I returned to workshops, I met Dagoberto Gilb, who became a wonderful mentor and friend. I finished my novel and eventually, Bilingual Review Press published it. What was the single best thing you did to improve your craft? What, if anything, do you wish you'd done differently? I wish I'd made friends at Texas State, but I was teaching middle school full time and commuting from San Antonio. I simply had no time to socialize. I didn't realize how important the networking aspect of an MFA program was until I graduated and found myself floundering with my second book. Some people can work in isolation, but I need feedback and the motivation that a critique group provides. So to answer the second question, I discovered and joined the Daedalus critique group in San Antonio and have been participating for the past five years. We meet once a month and the members have become my cherished friends. How did you find out that you'd sold your first novel? Did you celebrate, and if so, how? When I sold Confetti Girl, I treated my friends to margaritas at La Fogata. It's okay if Mom reads this one. 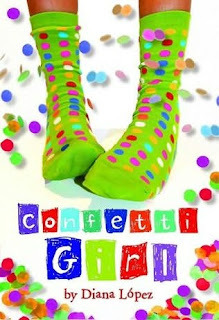 Congratulations on the release of your debut children's novel, Confetti Girl (Little, Brown, June 2009)! Could you tell us about it? Confetti Girl is my second book but my debut for the middle grade reader. It's about a girl named Apolonia Flores, Lina for short. She's a sockiophile (one who loves socks) whose mother died a year ago. She's ready to move on, but her father isn't. Meanwhile, she falls in love, verbally combats a bully, gets kicked out of sports, and endures many break-up and make-up scenes with her best friend. The book's called Confetti Girl because Lina's best friend's mom makes cascarones (confetti eggs) as a coping mechanism after her divorce. Cascarones are a Tex-Mex tradition. You fill eggshells with confetti and glue tissue over the hole. Then on Easter morning (or all during Fiesta if you live in San Antonio), you sneak up to people and crack the eggs on their heads. I had just finished visualizing Lina's home, how her father has so many walls of books. But I was really struggling to find a memorable visual for her best friend's (Vanessa's) house. Then I noticed a lady in my neighborhood selling cascarones. That's when it hit me: Vanessa's mom has a cascarones-making obsession! It's amazing how one detail can give birth to a whole character. But even so, I was halfway through the book before I realized how symbolically rich cascarones could be. I also didn't realize how little-known the practice was until I tried to get the book published. I had to take photographs and send instructions to the people in New York. At a dinner last year, a librarian from the Midwest asked, "So this is a family tradition?" Her eyes got so big when I told her it's something the whole South Texas region does. Maybe cascarones will go mainstream like piñatas and salsa. This book was inspired by Don Quixote. I was going to write a contemporary Don Quixote story about a father who loses touch with reality by reading books. In fact, my first title was "Dad's Windmill," and he's the first character I imagined though I sensed this would be from a daughter's point of view. Then Lina was born. I loved her. I had to chisel into stone to discover the other characters but Lina came to me fully developed like Athena busting out of Zeus's head. I started the novel in 2005. The year before, I'd won the Alfredo Cisneros del Moral Award sponsored by author Sandra Cisneros. I used the money to go to the Latino Writers Conference in Albuquerque. This practice of going to an agent's conference and pitching an idea in five-minutes-or-less is impossible for me. But I love to give readings. Luckily, the conference sponsored an open-mike. Each reader had five minutes. I must have done a good job because later that day, I had a lengthy conversation with Stefanie von Borstel of Full Circle Literary. She represents children's and YA literature, something many agents don't do. Plus, she had a lot of enthusiasm for my work. She said, "I know just the editor at Little Brown for this book." She sent it to many places, but in the end, it was Alvina Ling from Little Brown who championed my book. I don't mean to make the process sound easy because it wasn't. I had a lot to learn about writing for this age group. The book went through many, many revisions. But through it all, I could hear Lina’s voice, and her voice is what made this writing experience worth all the effort. I'm writing another middle grade novel about a girl who's named Windy (there were gusts up to 25 mph on the day she was born).